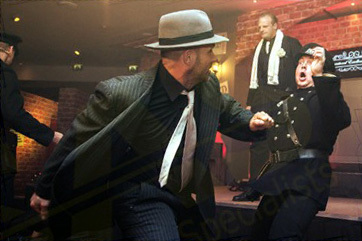 Whether you are holding a Cotton Club style revue, 1930s theme night or just want to add that something extra to a special occasion, The Stunt Team have years of experience with putting on high quality performances based on the Prohibition era and can provide exciting set-pieces to thrill your guests with four participants upwards. As with all The Stunt Team events, they are able to tailor the entire evening to suit your requirements. All the performers are experienced actors as well as stunt performers and will maintain character and American accents throughout the evening. 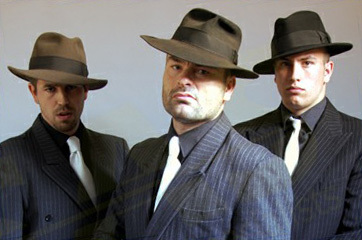 This Scenario is based on a standard five hit including MC/Head Gangster “Tony“ who will run the evening for you. 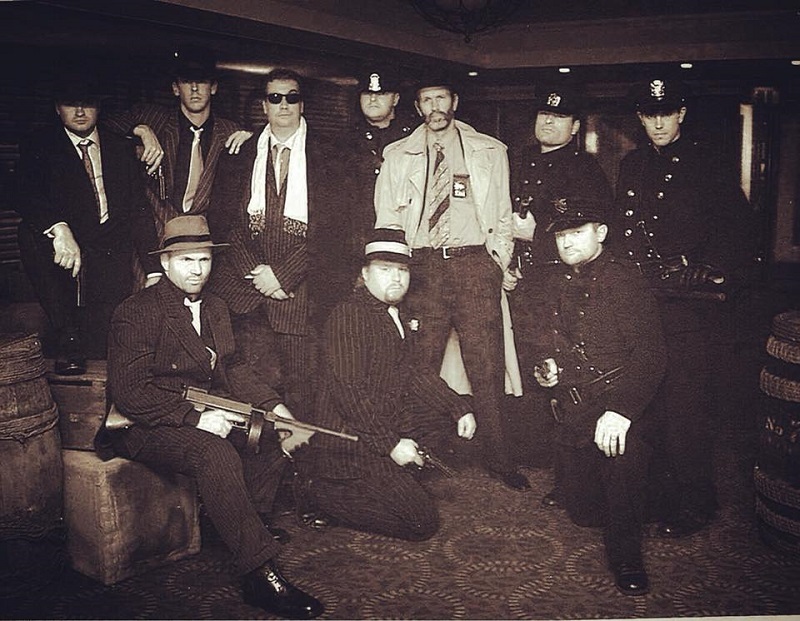 Guests are approached by two conventional undercover reporters (or digital if requested separately) in their long coats, trilby’s & notepads who attempt an impromptu interview about the hoodlums (the company/managers) who are running this speakeasy. As they get to the door, two “doormen“(greased back hair & black tux’s) check tickets & may perform a body search (subject to client request). 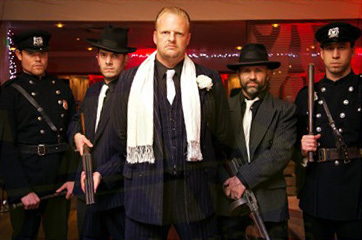 As they enter the speakeasy they are welcomed by Tony & two machine gun toting pin stripe suited gangsters. 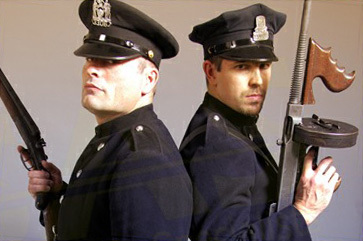 Once all the guests have arrived, the two reporters return to the dressing room to change into two cops and are joined by one of the doormen who also changes into a cop. Meanwhile the two gangsters in the club are joined by the second doorman who has also changed into a pin stripe suit, together with Tony they run the club. At a pre designated time a raid by the three cops will start with a gun shot and whistles as they make a dramatic entrance through the main door into the “club“. After a set dialogue the officer orders his two men to shut the bar. As they approach the bar they are confronted by two of the gangsters and a full six man choreographed fistfight then erupts, until the officer pulls a gun and stops the slugfest. “Fat Tony“ then bribes the officer with a “contribution“ to the police funds. A fee of $500 is agreed, and the police leave with their cash. Big Tony is not happy, someone has snitched on them and he wants to know who. 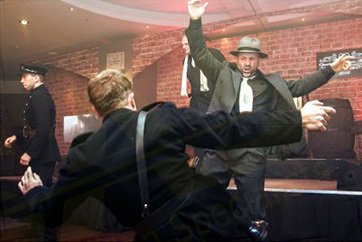 One of the gangsters is thrown into a chair in the middle of the stage/dance floor and interrogated until he shouts out three names who are associated with the company (these will be pre selected by the client and will be people who are well known and are game for a laugh within the company). Tony will call them out one at a time, sit them down, and then proceed to accuse them of various crimes such as double crossing, snitching etc etc. Intermingled with these crimes will be in company jokes and stories about the person (these details will have been passed on to us days beforehand to integrate into our standard dialogue). As Tony is about to have the three taken outside and disposed of, the cops return, the payment was $200 short and they are now determined to shut the club down once and for all. He approaches Tony for another $500, he gets twenty $5 dollar bills thrown into his face, both sides back off a few feet and then the guns are drawn and a spectacular full fire fight ensues, eventually resulting in the law being beaten. Then Big Tony then apologises for the disturbance and informs the client that the casino is now open! Machine guns, sugar glass bottles, shotguns, hand guns, violin cases etc. I booked these guys for a private function which I organised. One word comes to mind having used this group which is “Outstanding”. Words cannot express how professional and well mannered the whole group was during the night. The stunt act was beautiful choreographed and was customised to suit the night theme. The meet and great section was amazing with all actors playing there part to welcome all my guest and making them feel they are part of something special. Everyone that attended raved about them after the party and have no doubt that I will be using them again. One final comment is for Wayne. This guy is a true professional, what this man went through to make our night so special I will never forget it. So all I have to say again is a big thank you to you Wayne and all your crew and look forward in working with you guys again.